Perennial herb with tufted grass-like leaves. Erect grass-like leaves to 3 mm wide. Edges finely serrated. Bluish green in colour. 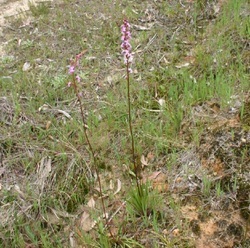 Each plant has only one vertical flower stalk up to 200-300 mm high but can be higher. Stalk has sparse hairs at the base but hair density increases the higher up the stalk. Up to 25 flower heads appear on upper section of stem. Flower has 5 petals, the fifth petal located behind the "trigger" is not always obvious. Colour pale to bright pink. Egg shaped seed pod to 12 mm long with small tawny-coloured seeds. 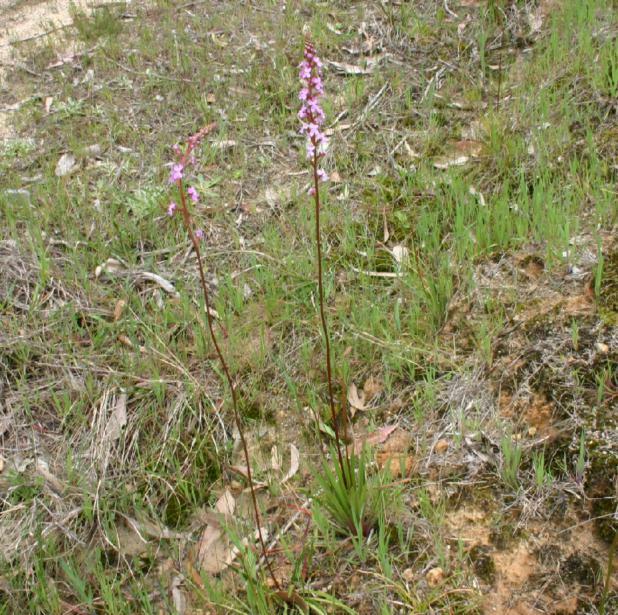 Naturally occurring plants in well drained open foothill forest and woodland and heathy areas. 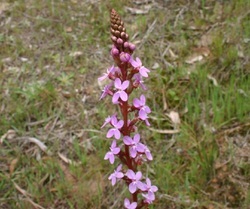 The hairs on the stalk in the area of the flowers contain glands which exude a sticky substance. Insects are trapped in this substance and the plant absorbs nutrient from these insects. The "trigger" mechanism found on these plants is used for pollinating. 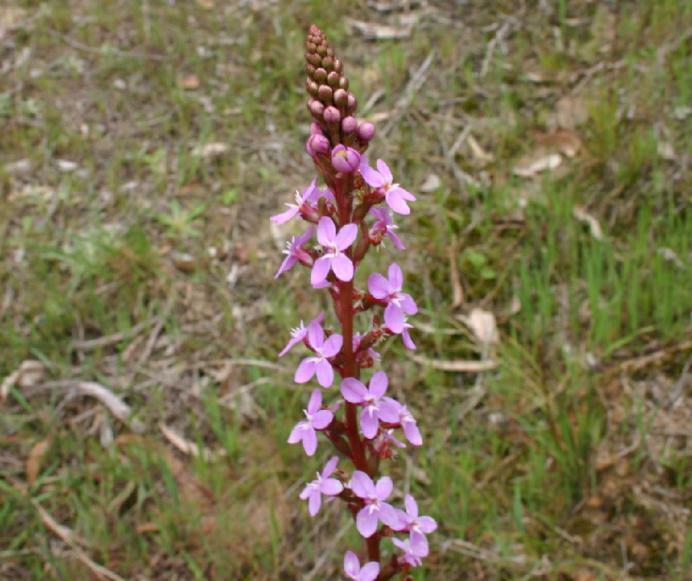 The trigger mechanism, referred to as a column, contains both the male (anther) and female (stigma) part of the flower. Initially the anther is dominant. When an insects lands on the plant and touches the "trigger" the column springs upwards and deposits pollen, form the anther, on the insect. The column then resets (after some period) in readiness for its next trigger. As the plant matures the stigma takes over and the stickiness of the stigma collects pollen from insects allowing fertilisation of the plant.